(Nanowerk News) Precision motion and positioning systems specialist PI (Physik Instrumente) LP recently obtained certification for the miniature, high-dynamics H-811.S11 6-axis motion and positioning Hexapod from the Camera and Imaging Product Association (CIPA), an international association of camera manufacturers that establish technical standards in the field of image generation. The H-811 Hexapod is the only six-axis motion and positioning system that meets CIPA standards for simulating camera shake on a defined and repeatable test trajectory while taking photographs. By certifying the Hexapod, CIPA adopted the verification methods of a vibratory apparatus for image stabilization as the new DC-011-2015 standard. The H-811.S11 is a compact, high-dynamics multi-axis motion simulator based on PI’s successful standard 6-axis mini hexapod series, especially developed for use as a vibration device in image stabilization test equipment. Together with its sophisticated vector motion controller it can produce precisely controlled and repeatable oscillation and vibration in multiple axes. In addition to oscillation mode, the H-811.S11 can also be used in positioning mode providing resolution down to 100 nanometers with linear travel ranges up to 34 mm and rotary angles up to 42°. 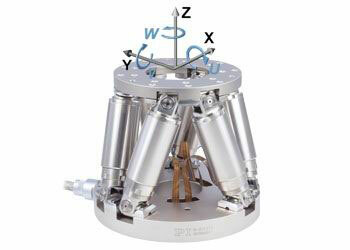 In positioning mode, the hexapod can be used for precision alignment and assembly of sensitive equipment such as opto-mechanical parts and photonics components.